Questionable Public Diplomacy: What was the Australian Government thinking? In an at least in Iraq unprecedented move, Australia’s government placed an ad in Baghdad’s streets. 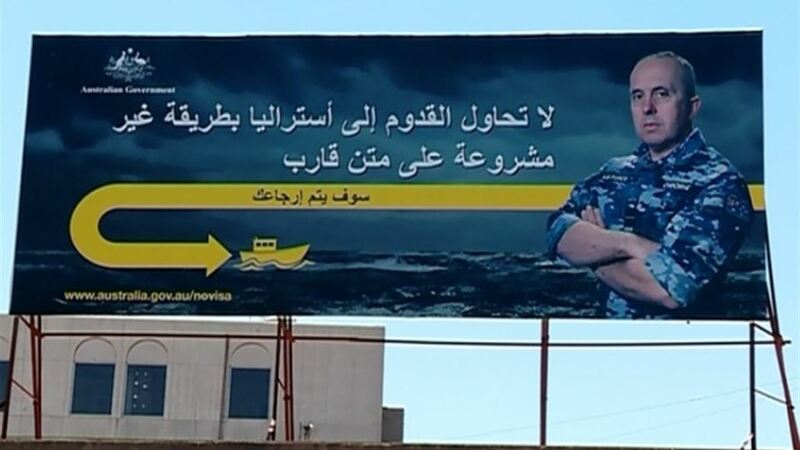 The ad shows a stern looking Australian security officer, a background with cloudy sky and rough sea, a cartoon boat, a backward-pointing arrow indicating the return of that boat to its origin, with a writing saying ‘Do not try to come to Australia illegally on a boat. You will be sent back.’ The Australian Government logo is in the ad, indicating that it is some official communication. By following the link provided in the ad, it becomes clear that it is part of an effort called ‘Operation Sovereign Borders’, in which Australia since 2013 has succeeded in preventing refugees from entering Australia illegally using boats. Interestingly, the link on the ad has the slug ‘novisa’, reasserting once more its aim to make the audience forget about Australia. Regardless of how effective these ads could be in discouraging illegal immigration, one thing is sure: this is a very questionable practice, not only because it is a far cry from the mantra ‘Refugees Welcome’ Europe has announced since the beginning of the refugee crisis, which regardless of how effective it has been as a policy, its humanitarian intent is clear and in alignment with what European societies strive to stand for. The problem with the Australian ad is that it represents some insensitive communication. It basically says without much fuss ‘Don’t try coming to Australia. We don’t want you!’ And of course the official procedures to immigrate to Australia don’t count here as a real response to the crisis because they take many months if not years, whereas Iraq today is in an unprecedented crisis with millions living in the harshest conditions. Back in 2015, Denmark did also place some ads in Lebanese newspapers, discouraging refugees from coming to the country. Denmark got some heat for it, but at least the Danish ads were providing actual justifications about why it is a bad idea to immigrate to Denmark, trying to bust some potential myths and correct some false ideas refugees might have about the situation there. Still, the Danish ad was deemed inappropriate. The Australian ad, however, is very dismissive and culturally insensitive. For starters, it seems that these billboards were not according to the guidelines set by Baghdad’s Mayoralty. The Mayoress of Baghdad has issued an order to remove them and investigate how they were installed in the first place. Obviously, having an official ad with the Australian government logo on it but not in compliance with local regulations is diplomatically not a wise move. Furthermore, in these harsh and difficult times, the ad signals to the Iraqi public that Australia at this moment is more concerned with being forced to provide asylum and basic services to a relatively small number of illegal refugees more than it is concerned with the fact that Iraq is part of one of the largest refugee crisis in human history, which affects the whole world, not only Iraq. Not to minimize any contributions Australia has made, but such ads have the potential to undo many of the good things Australia has been doing so far for the Iraqis. Any PR specialist could testify to that. Making the ad part of a campaign, named ‘Operation Sovereign Borders’ sends a message to Iraqis that there is some kind of war going on in which they as refugees are the enemies who are invading Australia’s sovereign borders. When reading what the Australian government has to say about it on its official website (by following the link provided in the ad), it seems that it is more concerned with priding itself that for 1000 days not a single illegal refugee has been able to enter the country, using strict and decisive language and repeatedly warning refugees from coming. The safety of the illegal immigrants seems not much of a priority.. Furthermore, the arrow, the stern looking soldier, and the cartoon boat give an impression that the audience is assumed to have some lower levels of intelligence. From a communication aspect, using simple and direct messages to talk about complicated issues might be effective, but again, good communication requires respect and understanding. The refugee crisis is a politically and culturally sensitive issue and this ad appears to make light of the sufferings and life choices refugees have to make. Besides, putting a questionable ad in Australia’s street or government website would be something, but putting it on the streets of another country is a whole new story. The image of a man in foreign military clothing and the logo of another government in a city that was not a long time ago occupied by the forces of that government (Australia was part of the coalition forces that invaded Iraq in 2003 and hence part of the occupation) with a message that demands something from the Iraqi public, either assumes implicitly that it still has some authority over Iraqis, or is at best neglecting the fact that during the years of occupation, Iraqis did make it clear that they were not comfortable with foreign military forces present on their soil, even if they helped them get rid of Saddam’s regime. It clearly ignores the possible association between foreign uniforms and crimes committed by some of the occupation forces in Iraq. Sadly, the number of Aussie terrorists who have joined ISIS is between 150-300. In comparison, that is about 20-50% percent of the special forces Australia has sent to support Iraq in its fight against ISIS. In addition to the fact that these Aussie terrorists pose a threat to Australians and the international community if they chose to leave the Islamic State and return back home, they are actively engaged in destabilization Iraq. Not to sound insensitive, but how would the Australian public, and more specifically the parents of these foreign fighters who are likely to disapprove of their kids’ actions feel if the Iraqi embassy in Australia would put ads in the streets, saying something like “Don’t think about joining ISIS. You will be terminated!” or “Don’t leave Australia for the Islamic State. You’ll never make it back home. We’ll make sure of it!”, with a stern looking Iraqi in military clothing? After all, the Aussie foreign fighters are also ‘illegal immigrants’ and definitely pose a larger threat to Iraq in comparison with the Iraqi refugees entering Australia illegally. Every country has the right to set its own immigration policy. Illegal immigration poses security threats in addition to other financial burdens and logistical issues that not every country is able or willing to provide. Iraqis understand that. However, since years Iraq has been the ‘forefront’ of the fight against terrorism. The fight against terror has its costs, the highest toll being paid by the Iraqis living in the areas affected by the fighting. Millions have been internally displaced and are facing the harshest conditions. Many people have attempted the most dangerous journeys to seek refuge in Western countries and have lost their lives, after losing their hopes. Western societies have struggled to receive the huge influx of refugees but nevertheless, have not stopped trying despite the many setbacks and legitimate challenges. But telling the Iraqi people they should not come to Australia in this manner is not respectful. If Australians are worried about the uncontrolled influx of refugees to their country, there are better ways to address the issue. Greece and Italy are paying dearly since the crisis has started, because of the many refugee boats and the rescue missions these countries are forced to conduct on their coastlines, and because other European countries are not always keeping their promises in regards to refugees. No need to say that the numbers of illegal immigrants entering Europe through sea are way higher than the influx Australia had before starting its ‘Operation Sovereign Borders’. Yet we didn’t see any ads by these countries put in Baghdad’s street warning refugees with a rather harsh and insensitive tone. With all due respect to the Australian decision and policy maker, and what Australia as a nation stands for, the real issue here is whether Australia cares much about what Iraqis and the rest of the world will think about it. The principles of public diplomacy say that it should, especially in a time of crisis. The Iraqi people deserve a more respectful way to be addressed with. After all, many of them are giving their lives to make the world a safer place. Thanks to Adriano Pedrana who contributed to this piece by providing ideas and feedback.